Edit: 4/27/11 with the name of the Dog. Edit: 4/27/11 with information on Sasuke coming to NBC. Updated with new TokyoGraph article in English. Updated again ... it's not Sasuke coming to NBC.. it's friggin ANW /facepalm and Confirmation that Nagano will NOT be in Venice Beach. Nagano's got a little wiener! Dog... Going to see if I can find out what the dog's name is! It's cute! I didn't realize it's been almost a month since I last posted. 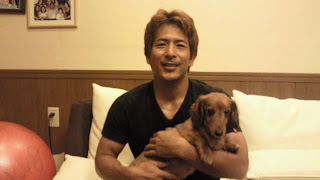 There's an update from All-Star Makoto Nagano 長野誠 on the yodaraji radio station website. I've been expecting another radio interview with Nagano for a bit but with the delay of his music CD I wasn't sure if there was going to be one. His last yodaraji interview was this time last year. The interview itself for April, 2011 is very different. The show itself is short with the first part (almost 13 minutes of the total 15 minute broadcast) is about a new type of dessert from a local man from Nobeoka (where the radio station is from and incidentally where Nagano was born and raised). Nagano's part is actually a pre-recorded message where he is wishing Yodaraji a happy 5th year anniversary. This was played all the way at the end of the episode. (His part starts approximately 13:40). I seem to display my clothes in the American preliminary meeting place. Clothes seem to go to U.S.A. in place of me. Edit: Confirmation that Nagano will NOT be in Venice Beach. He was asked to send clothing for the charity auction this weekend instead of him coming to the USA. It has also been announced that G4 and TBS are collaborating for a disaster relief project that will raise funds to be donated to the Red Cross. From April 29 to May 1, they plan to broadcast “Ninja Warrior Japan Relief,” a 50-hour-plus marathon that will be encouraging donations and running a charity auction. Nagano does goes on to talk about his music CD release (release date is finally May 11, 2011), that it can be downloaded or be bought from Amazon (he thinks, he doesn't really know what it is... yes.. he giggles on his own recorded message.. LOL) . I've been trying to update the page with the options where to buy the music CD. There's Itunes, Amazon for the Westerners and a bunch of other places for those in Southeast Asia. As I find out more I'll update it to that specific page. Would be cool if he sang the song in public.. but he's apparently too shy.. LOL So if you want to hear him sing, please support his release and buy the song when it's released in May! Then he talks about Maguro Festival to be held this weekend in Kagoshima. This was actually the last post I talked about. 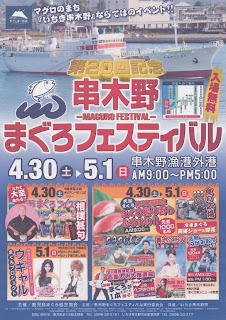 The 20th Annual Maguro Festival 第20回串木野まぐろフェスティバル will take place the end of this week in Kagoshima Prefecture on Saturday April 30 and Sunday May 1, 2011 in the city of Kushikino. This is a local Tuna event for the port city of Kushikino. It's pretty much a county fair including games for kids, music, food and other activities for the whole family. The past few years the company Nagano works for, Takasui Corp. has participated in the event (since they also use this fishing port) and during that time they had Nagano design and build a Sasuke set where he could demonstrate his skills along with a few of his friends to the local crowd. This year Nagano was able to send me a list of invites going to this year's event in April. At the end of the recorded message, one of the hosts of the show (either Tachan or Miki ) quips that Nagano sure didn't sound very enthusiastic while the other comments that he sounded sleepy... as always. Poor thing, Nagano must have sent the message when he got back from fishing.. Either way this is the only update so far. 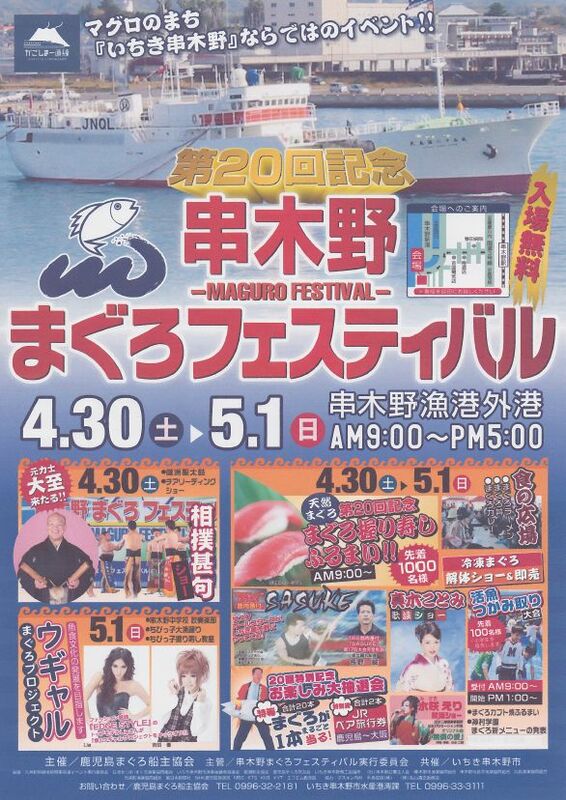 Next week I hope to update the site with pics and videos of the Maguro Festival as a few people we know are going. If any concrete messages from TBS and/or Monster9 arrive about Sasuke 27 I'll be sure to add that as well. Edit: As Ube found earlier today there was an official announcement made on the TBS website (TBS is the official broadcaster of Sasuke in Japan). He has since done a post trying to get to the bottom of this announcement and has been collecting all the articles written on it. U.S. television network NBC is planning to broadcast the popular TBS sports variety program “SASUKE” in a prime time slot this fall. This is said to be the first time that one of the four major U.S. broadcast television networks will air a live-action show from Japan. NBC, in an apparent partnership with G4, will broadcast the 27th “SASUKE” competition as the climax of the third season of “American Ninja Warrior,” which is scheduled to start this August. NBC has not yet announced a date for its broadcast. From the sounds of it.. Sasuke 26 will be shown on G4 this weekend (sans the Americans as we have been warned) and supposedly there is a Japan Relief marathon that I don't see advertised at all.. typical G4..
ANW3 will be aired in 10 parts in August on G4 it seems. And Sasuke 27 will be shown on NBC (network television/national free to air here in the USA) sometime in the fall. This is the intriguing part. (Cutting and pasting from another thread) It's unclear what they plan to do on NBC this fall. Not sure if they will air a G4 version of 27 (NW chopped up version omitting the Americans whenever it's tied to ANW), the Sasuke version like Taiwan shows it (with just subtitles and deletion of sponsors with a new opening and closing) or if they plan to do a Viking version the way they did it in ESPN back when they showed Viking (as a friend of mine suggested). If it's a true NBC production they might do a whole different broadcast to suit their needs.. I'm almost afraid to see.. but I'll cast judgment later when I see it. G4 is a Comcast channel.. but Comcast just BOUGHT NBC.. so now it all makes sense.. Still no idea how the broadcast is going to look like.. for the love of all things holy it better be different than the Ninja Warrior travesty.. but I'm thinking they might Viking/ESPN this which IMO was worse.. Still.. it's a totally different audience and they cannot rely on what happened on G4.. which means.. they can't omit the Americans from Sasuke 27 on NBC even though it's tied to ANW3. So far G4 has been consistent in deleting the Americans from the broadcast if it's tied to ANW.. we'll see what happens this fall. In the third season, the show will head to Japan and touts the biggest prize yet for the show, a $500,000 K-SWISS endorsement deal and marketing campaign. Also, G4 and the Tokyo Broadcasting System will auction off a chance for a fan to compete with the 10 finalists to benefit American Red Cross relief efforts in Japan. Production starts next month.